Hi everyone! Today I am interviewing a very experienced maker along with his great team. I first met Ezahn a long time ago, in 2011 when he was still working from a very small basement. In fact, as soon as I heard that someone else on this planet was making what we now call handpans, I jumped in my car and went to visit him. At that time, apart from PANArt, very few people were able to make this kind of instrument, you could literally count them on the fingers of one hand. Then I discovered the AsaChan…Wow! 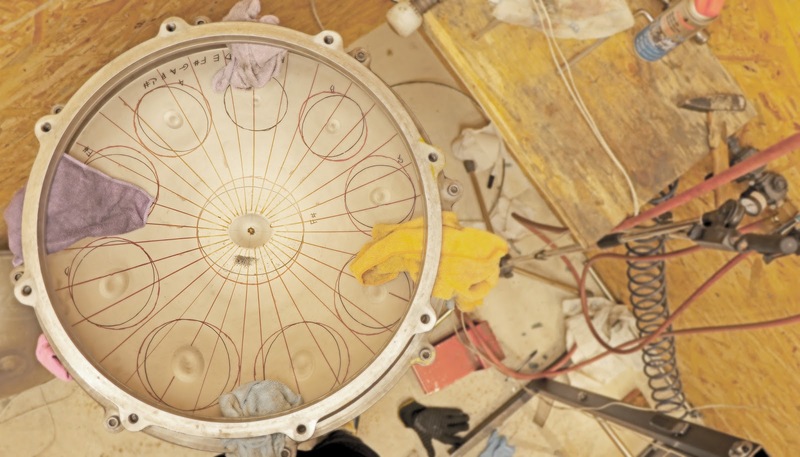 Now let’s meet the incredible EchoSoundSculpture team. Could you tell us a bit more about yourself guys? Ezahn: I am originally from Thailand but have lived in Switzerland since 2009, after marrying my Swiss wife. I graduated from Silpakorn Art University in Bangkok, Thailand and I am passionate about art, design, music, and food. I had always dreamt about becoming an instrument maker one day, although initially I thought I wanted to be a guitar maker. However, destiny has brought me to work on hammering steel instead of sanding the guitar body. Valerio: I started play handpan in 2012. At the end of 2015, after a concert in Paris, I decided to learn to tune and was fortunate on my journey to meet different tuners who taught me many things, one of them being Ezahn, the guy I work with now. Music has been the most important part of my life since I was a child; before playing the handpan I played the drums for over 10 years. I graduated in political science from the University of Turin. I live in Lenzburg (Switzerland), but I grew up in Pinerolo (Italy). Flavio: I am Flavio. I was born in Brazil in 1980, came to Switzerland in 2013 and some months later I started to work with Ezahn in the basement of our house. I was a video editor for a TV music programme for 8 years of my life in São Paulo city, but it was with a hammer in my hands that I found what I love to do. Ezahn: Before I started to make the AsaChan, I was an artist (fine art) in my professional life and a musician in Bangkok, Thailand. In 2008, I moved to Switzerland. I have always been very interested in hand-crafted work and in 2010 I started making the AsaChan. When I lived in Thailand I dreamt of being a guitar maker, but life led me down a different and unexpected path. I saw someone play the pantam/handpan on the street back in 2008 in Switzerland. I totally fell in love with the sound of it and I thought the musician had made the instrument himself. After, I went back home, took the wok pan that I used to cook Thai food every day and started to hammer and tune a note on it, but in my enthusiasm it didn’t come out well. Since then, my hammering has become more serious and a real passion. Valerio: As a handpan player I toured non-stop for 3 years, playing over 200 gigs in about 13 different states. At one point I was very tired, so I decided to take a break, but at the same time I felt that the most natural way to continue making a contribution to the community was to start making. So I gave it a go. Flavio: When I came to Switzerland I wanted to change my career, to leave the world of video editing sitting in front of a screen and move towards something more handmade, more artistic. Then life made the choice for me when I became Ezahn’s neighbour, and 4 or 5 months later I started to work with him, in the dark, cold basement of a 150 year old house. How did you find the name for your instruments? What’s the story behind it? Flavio: When we decided to build a small instrument Ezahn let me take the lead, so following Ezahn’s system of creating names for the instruments, I chose a language from the natives of Brazil called “Tupy Guarany”. MiRim means Small. What do you like the most about handpans and about our community? Ezahn: I love the minimalistic idea/concept of it. There are only 7,8 or 9 notes in a circle but it touches people’s hearts, and is accessible to everybody. Pantam/handpans have a unique sound character compared to other musical instruments. 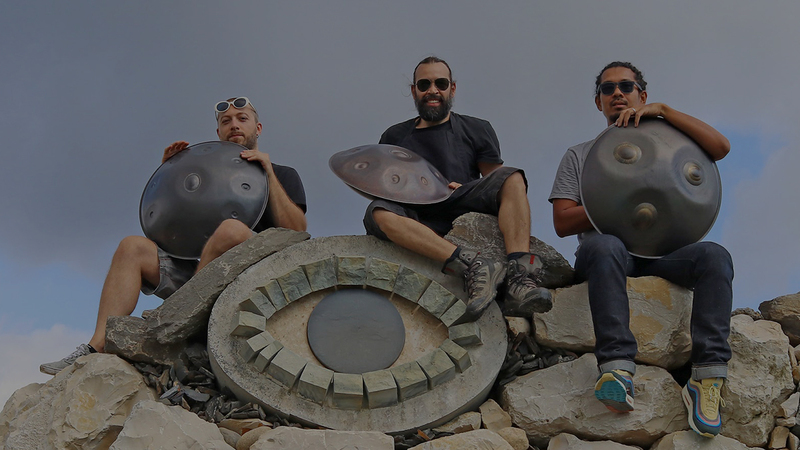 Valerio: The handpan phenomenon is growing every day, but it is the people that keep the family spirit alive that was there from the beginning. Musically it took me away from a bad situation. I was working as an economist in Turin and I hated it: it was something like 8 /10 hours sitting in front of the laptop every day and I had no time for music anymore. I guess I was unhappy with my life for some years, then the handpan entered it like a thunderbolt and it changed everything (for the better). Flavio: I love the tuning process and the idea that I am working with a very new instrument that still has a lot of potential to be developed. I also like the idea that putting more handpans out there in the world helps to make it a better place. Ezahn: Travelling the shaping steel journey and understanding the relationships in the curve geometry. Hammering is like a walking meditation through a forest and playing every AsaChan after it is finished is like touching a lover. Flavio: The play between the hammer, the fundamentals and the partials. Valerio: It’s like a mirror: everything that influences or touches us in life, goes into the making process. Flavio: Since the start, the EchoSoundSculpture slogan has been “made with love and passion”. Not so hard when you do really love your work. So I believe love concentrates all the values necessary for a great instrument. Ezahn: Exactly like Flavio said. Valerio: The development of 1.25 mm took a lot of time, but we are finally at a point that we can consider rather exciting. For the rest, the biggest news I can tell you is that in the near future, hopefully at the beginning of 2019, we are going to release an instrument that is completely new in the Pantam/handpan environment, but still considered part of this family. Flavio: In 2018 we went deep on EchoSoundSculpture 1.25 mm shells, and the result is a perfect combination of sustain, stability and a ceramic touch. At the same time with the 1mm we developed some AsaChan MiRim lower Scales with an Eb centre note and Bb to match with other AsaChans to build a chromatic set. Ezahn: We are always trying to bring out the very best in all EchoSoundSculpture materials. How can we purchase an instrument from you? How does it work? Do you have a waiting list? Flash sales? Email? Etc. Do you have an anecdote/funny story related to handpans/making/etc? Valerio: In 2014, when I got my first AsaChan, the appointment to collect it was in Rupperswil, but when went to buy my ticket at the train station I said the name of my destination in an english way, changing the “u” into “a”, and so the guy gave me a ticket for Rapperswil, which is 1.5 hours by train from Rupperswil. I was so happy to be the first to arrive at the station, until I realised my mistake! Do you have a favourite saying you’d like to share with us that relates to handpans or making? Ezahn: Keeping healthy (physical condition, mental well-being, and good food) is very important for the focus and concentration required to create great instruments. Do you have any advice for anyone who wants to start making handpans? Ezahn: Every time you make a mistake, try to understand the mistake and improve the next time. Valerio: Have fun and keep on having fun. Results will come. Keep your feelings simple: if you look at it like a very hard challenge, you are just going to make everything difficult for nothing. Flavio: Focus on the sculpture, on the form, not just on the sound. A good shape will make the work easier and will sound better. If is not working take a break, at the begin tuning is like a fight, but with time it’s your job to transform the fight in a dance.